All pets, large or small, are welcome at Bison Ridge Kennels! 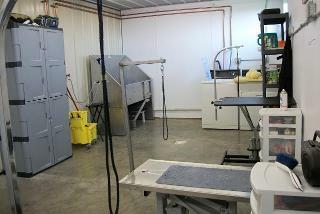 Here at Bison Ridge Kennels, we offer a wide variety of things for your pets. Weather you have a new puppy and don't want to leave them home for a few hours while your at work, or you are planning on taking a trip, we will work with you and your pets needs the best we can. We offer boarding, daycare, and grooming for cats, dogs, and other pets. We require Rabies, Distemper, and Bordetella (kennel cough) to be up to date while boarding. We require Rabies, and Feline Leukemia to be up to date for boarding. We do not require medical records for birds, small mammals, reptiles, and other exotic pets. Bison Ridge Kennels offers both long term and short term boarding. We have two different types of kennels; an indoor kennel and an indoor/outdoor combo kennel. Our indoor kennel is a 4' x 4' kennel, while our Combos are 4' x 4' indoor kennels with a doggy door that leads to a 4' x 8' outdoor personal run. This run has an overhang to protect from the elements. It doesn't matter which kennel works best for your pet, because all dogs go out a minimum of 5-6 times a day. The time they are outside varies according to weather and your pets wants. We require proof of rabies, distemper, and Bordetella (kennel cough) for all boarding dogs. You will be charged for the day your pet comes in regardless of time. If you pick up prior to 10:00am Mon - Fri and 12:00pm on Sat, there is no charge for that day. A minimum stay of two days is required for all holiday bookings. PAYMENT IN FULL IS REQUIRED BEFORE PET IS RELEASED (Unless previous arrangements have been made). No pet will be released to a person who is not the owner without prior, written authorization. Please feel free to call or e-mail us with any further questions you may have. We want your pets stay with us to be the most enjoyable experience possible. Bison Ridge Kennels offers both long term and short term boarding. We have a separate cat room with lots of toys and towers. We have a window for them to bask in the sun, or places to climb and hide. We do not intermingle the cats, but give ample time to play. All cats get to come out to play. Prices for cats is a flat rate of $12.00 per day. A happy, content dog at the end of the day that provides you with a guilt free alternative to leaving your dog alone all day. We require proof of rabies, distemper, and bordetella (kennel cough) for all daycare. Certified groomers at Bison Ridge Kennels keep dogs and cats looking great! Whether you want your pet to look great, or simply be clean and fresh, our groomer will take care of your pets needs. We groom Monday-Saturday, by appointment only. We require proof of rabies, and distemper for all grooming services. All grooming services are 15% when your pet is boarding with us. Our guest check-in paperwork helps us get to know your pet on a personal level and helps provide us with information to better care for your pet. We do not recommend "free feeding" because we prefer to monitor a dog's/cat's food intake while residing with us. However, we will do so per your request if this is what you do at home. Are there any food possession/toy possession issues?